Role: Provide an introduction/context for the strand and identify key topic areas to stimulate discussion. Inspirational, maintain conversation flow and focus, facilitate the group, guide the conversation to keep it on track. Participate in the development and delivery of pre-conference 1-hour webinar with youth participants. Report out strand group discussions at plenary sessions at the conference. Provide feedback on conference report or other documents post-conference. Role: To capture and digest overall, key themes and questions that emerge from the strand discussions. Provide a summary report (after the conference) based on key messages of discussions in the strand. Participate in pre-conference webinar. Provide feedback on conference report or other documents post-conference. Verlie Ann Malina-Wright (Native Hawaiian) will participate by interacting with the youth early in the conference, and by facilitating a “Fishpond” conversation among the youth. The Co-Principal Investigators, Dr. Nancy C. Maryboy (Navajo/Cherokee) and Ka’iu Kimura (Native Hawaiian) will give guidance and play supporting roles as needed. Note: These questions are just a starting point to foster discussions. We encourage the youth to exert their leadership and evolve/change the agenda and the questions as they deem appropriate to be more in concert with their experience and native upbringing. 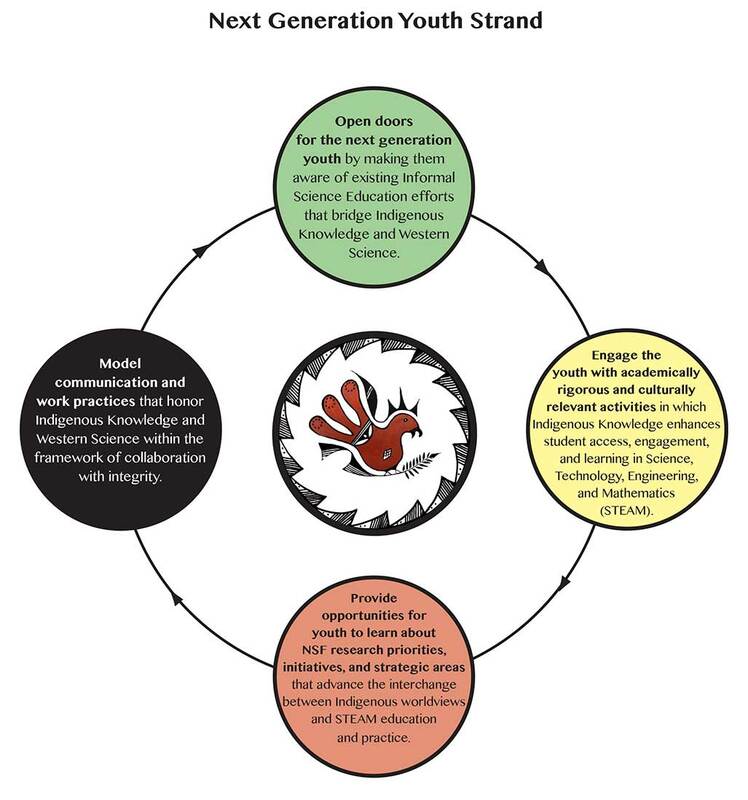 EAST: Open doors for the next generation youth by making them aware of existing Informal Science Education efforts that bridge Indigenous Knowledge and Western Science. SOUTH: Engage the youth with academically rigorous and culturally relevant activities in which Indigenous Knowledge enhance student access, engagement, and learning in Science, Technology, Engineering, Art, and Mathematics (STEAM). 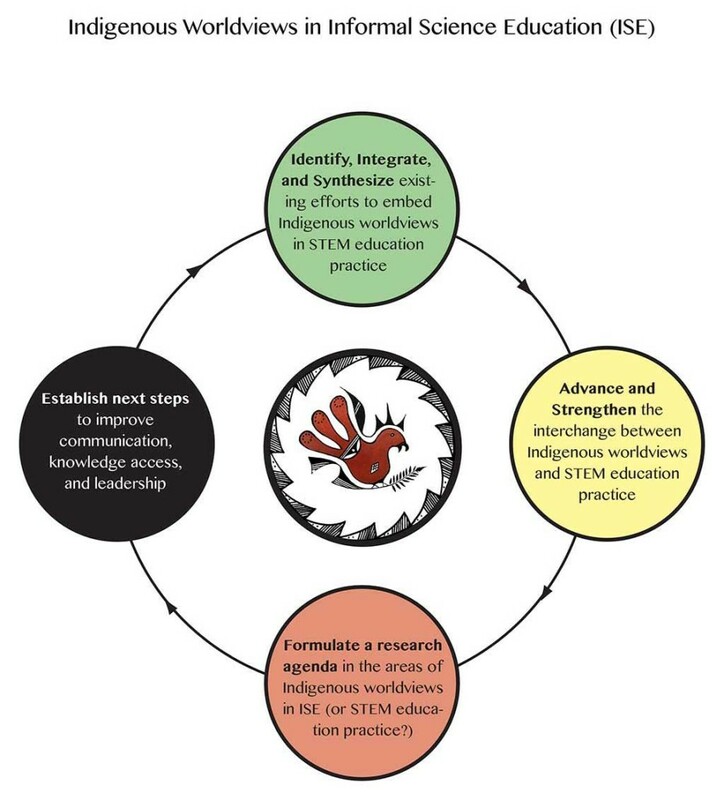 WEST: Provide opportunities for youth to learn about National Science Foundation research priorities, initiatives, and strategic areas that advance the interchange between Indigenous world views and STEAM education and practice. NORTH: Model communication and work practices that honor Indigenous Knowledge and Western Science within the framework of collaboration with integrity. Traditional fishponds (loko iʻa in the Hawaiian language) are an ancestral method of aquaculture practiced by Native Hawaiians, representing an advanced method of fish husbandry among the original peoples of the Pacific. In addition, the youth are invited to participate in a webinar on August 28th, hosted by the strand facilitators, strand synthesizer Tim Hecox of OMSI who has experience with native youth councils, and Fishpond moderator Dr. Verlie Ann Malina-Wright who is a world renowned science educator with a great deal of experience with youth and culturally-based educational strategies. The title of the Webinar, “Science of Place” will set the context for the conversation. “Science of Place” has been practiced by Indigenous peoples throughout the world for countless generations, and within the context of the NGY strand, can be defined as long-standing knowledge of the environment in a particular locale that allows a community to lead healthy lives for thousands of years. Science is rooted in the cultural identity of a community and thrives when humans live in concert with nature and follow the cosmic order. “Science of place” is passed on to future generations through all forms of human cultural expression. As part of the invitation to the webinar, the youth will be asked to think of a tradition or activity that is culturally based and that also has a scientific, technological, engineering, or mathematical component or foundation. Cultural perspectives: Where is their grounding coming from (or not)? How did their cultural upbringing influence their understanding of science (environmental, informal, cultural contexts)? How are the education systems supporting, or not supporting, their worldviews? At Acoma: Six or seven Acoma Pueblo youth will be invited to the conference. Acoma Council will take the delegation first to the church, and one of the youth will talk to the delegation about the history of the church to set the stage in the context of bringing together the two cultures. Other youth will be there to answer questions of participants as they view the feast, and will take the participants to the homes where they will partake of the feast food. In Albuquerque: Welcome and opening remarks. To emphasize the importance of the next generation youth, the conference will open with a prayer and dance from a local Pueblo youth, Kyle Swimmer. Youth will meet their Strand Facilitators/Leaders. There will be a local Storyteller who will provide context of place. The strand facilitators will clarify for the participants that the youth strand involves the youth and pre-selected facilitators to provide coherence and build camaraderie among youth; thus it is the only strand that is not “open” to all audiences in the same way that the other strands are. The youth will be asked to introduce themselves to the other participants. Participatory activities that feature the science embedded in indigenous knowledge and traditions will engage youth in discussing the conference goals and key questions through immersive experiences. For the NGY Strand, each break session will offer the youth participants opportunities to engage in indigenous games, an indigenous game facilitated by Richard Horn. NGY strand leaders ask for volunteers from the youth to attend the various conference plenary sessions and contribute as reporters of the results of the conference. How can traditional knowledge inform and nourish western education P-21? To emphasize the importance of the next generation youth, the evening will include traditional social dances from Kitzit: Laguna Youth Dance Group, a local Pueblo youth dance group. NGY Strand: Youth take the lead in this session, working in small groups to collect their photos/videos/interviews. They will be asked to identify four key issues for future work that align with the Diné strategic plan model. (Tim will moderate this part). NGY Strand “Fishpond” Moderated Discussion: So that the youth can all participate in an egalitarian conversation space, the conference will include a “Fishpond” moderated discussion where all youth will be invited to sit in a circle in middle of the room facing each other, with Verlie Ann Malina-Wright among them. The remaining conference participants will sit around them, observing and listening to the conversation taking place within the fishpond. The four youth who volunteered to be “reporters” will offer those perspectives to the conference participants. Verlie Ann Malina-Wright will moderate the conversation where the youth address the discussion questions and outcomes in an open/informal but focused conversation. After a certain time, the conversation is open to the other participants who can then ask questions.